I’ve been on hold for three days. Yes, you read that right. For three, very long days I have been trying to sort out E’s latest insurance issue. You see, last month I received a letter. It said that E was approved for one type of insurance, another had ended (due to us making too much money) and that he had that same insurance that had ended but now with no premium (due to a decrease in our income). Confused? So was I. When we received the letter, I tried to call, but sat on hold for several hours until the end of the workday (when they go home and leave you on hold). So, the next morning we had an appointment and they said E’s insurance was fine. Except, 8 days later, his prescriptions are coming due and we get notified by the pharmacy that his insurance is denied. Hubs in super hero role, as I drive down the road taking A to yet another skating practice, gets on the phone. He is told to call a variety different numbers and ends up finding that since it is Sunday everything is closed. No biggie, I’m sure there is something weird happening and hop on the phone at 8am the next morning. Did I mention that the company I work for was dealing with Hurricane Irma and I was responsible for the phone calls and student support? Still, focused and multi-tasking – as I feed C some banana mixed with breast milk – I start making phone calls. The first person I speak to tells me that she can’t see why the insurance got changed and that it looks like a glitch in the system but he has insurance. Okay, I can move forward with this. I contact E’s ABA provider and have her check. No insurance, he’s not getting services today. Day 1 ended with me having called four numbers and been told he was insured 3 times. I was still on hold at 5 with the last one. Basically, they go home and leave you on home. It is finally after 5pm and I have gotten nowhere, so I hang up and switch gears. Now, it is time for me to braid hair and get A to a volleyball game. Because life wasn’t busy enough, she signed up for a third sport. On to skating right after the game and then finally we head home. Still no dice with the pharmacy. Day 3. Hubs had to work a few hours away from home today, so I get up and get kids to school and I’m ready at 8 to start the calling again. I had already been working for about an hour due to company calls from the East. Number 1, back to the county. I’m on the phone for an hour and a half and all of the sudden the message and elevator music stops. The call has disconnected! It’s okay, I try again. This time I’m on the line for 2.5 hours (through E’s school lunch that I sit at, drop off a grandparents day gift and head to piano lessons). I finally get a human. She starts off not understanding the problem, then she does understand the problem but says it can’t be fixed. I argue that my ABA had another client that had this happen and they were able to call the county and have the issue fixed. She finally comes up with a number and I call it. I leave a message. The lady calls back and I am able to explain the issue. She tells me that we make less per the Department of Labor than what our last pay report said. Um… okay, how is that a problem? Down the rabbit hole. I get told that the county can’t help. All they can do is reapply. No. I don’t want to reapply. I want the damn insurance back, somebody flipped it off, who can flip it back on. She tells me that the state line on the back of his card is the number to call to get everything fixed. I call it. I sit on hold for another 45 minutes. Somebody answers, her name is Agnes. I thank her for her time, explain my issue and she informs me that this number has nothing to do with that and sends me back to Day 1’s last number (that I am still waiting on the call back from when my turn in line comes). Fine. I call it. I sit on hold. I can’t just sit there, I’ve got two days before there is no more medication and that is not acceptable. I send another email to the Program Coordinator. I tell her that I contacted the county, tried to get an address to make a formal request and was informed that they don’t handle it and I am to call the state. Everything is paid up to date, what can I do to make this happen? This gets her attention. She says she is contacting the county and will let me know when she gets more information for me. I remain on hold because honestly, I don’t really believe that anyone knows what they are doing at this point. I get ahold of another person that says my son has active insurance, E can get his meds. So I call the pharmacy. Nope. They can’t run any insurance. At 4:30pm, Hubs comes home. He takes the baby, I can actually go to the bathroom while he babysits the phone line. I get back and decide to try calling the number on the back of the insurance card one last time. A lady accidentally answers the phone. Whoops! (but I’ve got her now) I explain that my son is about to be without medication and I really need this resolved. She hears the panic and we call the pharmacy together. Apparently, the state added a letter in his billing code. His meds can be picked up. Unfortunately, it is after 5, the other number is still on hold while all of the operators have gone home and my Angel of Mercy informs me that that other number is, in fact, the only number that can help reinstate E’s full insurance. She tells me to try again in the morning. At this point, I’m exhausted, overwhelmed and on the verge of hysterically crying. It is scary when your kid doesn’t have insurance. It is even scarier when that insurance is what helps him function in the world. Without the insurance there is no ABA and that isn’t going to work for E.
So, tomorrow, I will be back on the phone. On hold. Praying that this call will lead me to the person who knows what they are doing and can fix this. Here’s my list of what is needed to handle the Medicaid Buy-In. Most recent letter sent to you by the state office. Coffee, go ahead, hook up an IV. Phones. 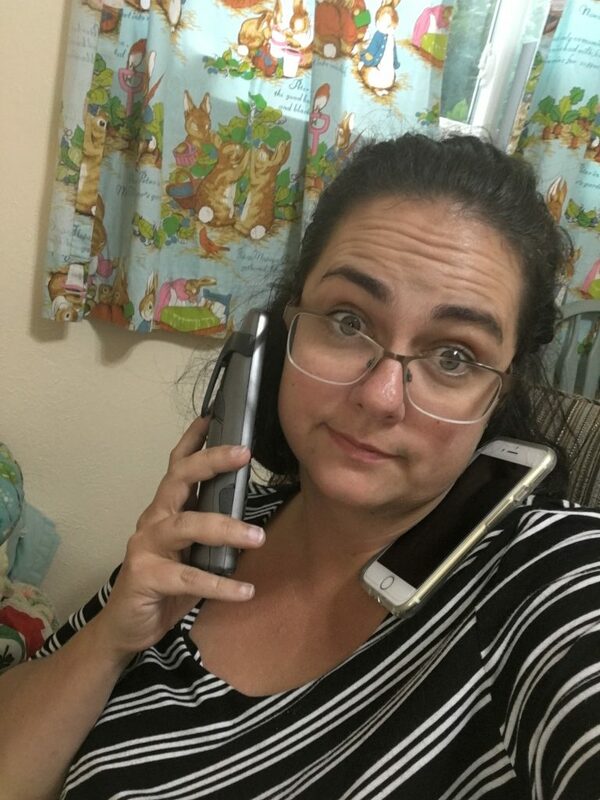 You need all the phones. For this week’s adventure I have used as many as 3 phones at the same time. Wine. I’m hoping it drowns the echoing of the hold music and notice sometime this decade. A sense of humor. – Because if I don’t laugh, I will be crying – ask my mom. I’ll update the list when I get everything resolved, of course. My hope is that these bad experiences lead to easier ones for other moms out there.